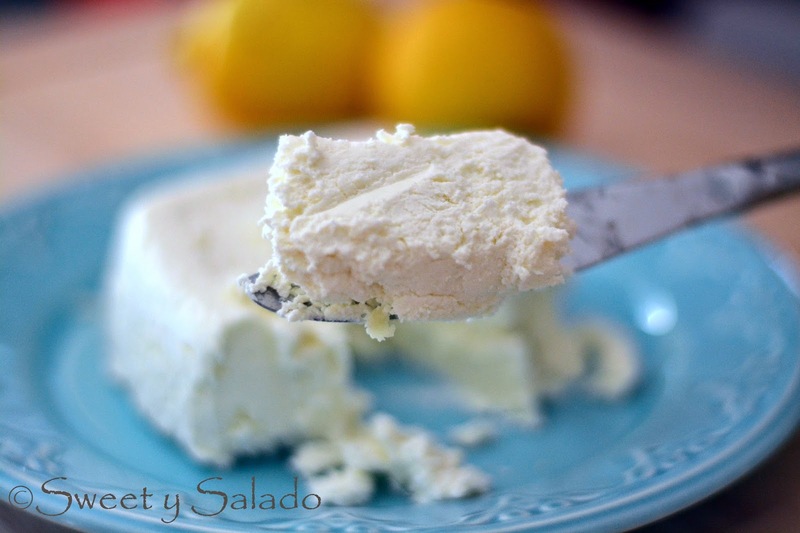 When I was a kid and we were living in Palmira, Colombia, my mom always went out grocery shopping every Saturday morning and one of the things she always bought was Colombian queso fresco that was sold fresh at the marketplace. I loved going with her only because the man who sold this cheese always gave us a thin slice for us to try before buying it and I would happily grab it from him because it was delicious. He would then wrap the cheese with banana leaves, the same ones we use to make Colombian tamales, and when we would get home the cheese tasted even better because of the delicious aroma the leaves gave it. Colombian fresh cheese is similar, and in my opinion, practically the same as Mexican queso fresco. It’s a very easy cheese to make since all you have to do is add some type of acid to the milk for it to curdle, then you strain it and that’s it. The whey that comes out can also be used for making fruit smoothies or even soups because it’s packed with protein which is easier for the body to absorb, this makes it perfect for building muscle and losing weight. I hope you enjoy this wonderful recipe, not only with Colombian arepas which is the way we serve it often in Colombia, but also to make our Colombian buñuelos (cheese fritters) and pandebonos (cheese bread) which are also very popular in our country. 1. Pour the milk in a large pot and bring it to a slow simmer on medium heat. 2. Add the lemon juice or white vinegar and stir. Remove the pot from the heat, cover and let it rest for about 20 minutes so the solids can separate from the whey. Add more juice or vinegar if necessary. 3. Place a colander inside a large container. Then, place the cheesecloth over the colander and drain the liquid onto it. Wrap the cheese with the cheesecloth to form a ball and try to squeeze out as much liquid as you can. Finally, hang the cheese for about 30 minutes so the liquid drains out completely. 4. Place the cheese in an airtight container and season it with salt to taste. Cover the container and refrigerate overnight so that it comes out dry and firm. You can serve it with Colombian arepas or use it to make Colombian buñuelos (cheese fritters) or pandebonos (cheese bread). Store cheese for up to one week in the refrigerator. **Note: The whey can also be used to make fruit smoothies or soups. Un galon o un litro? Es 1 galón, que son más o menos 16 tazas de leche, cada una de 8 onzas. Un litro apenas tiene 4,22 tazas, lo cual no es suficiente para hacer una buena cantidad de quesito. Hi KR, the best cheese to make buñuelos and pandebonos is queso costeño. 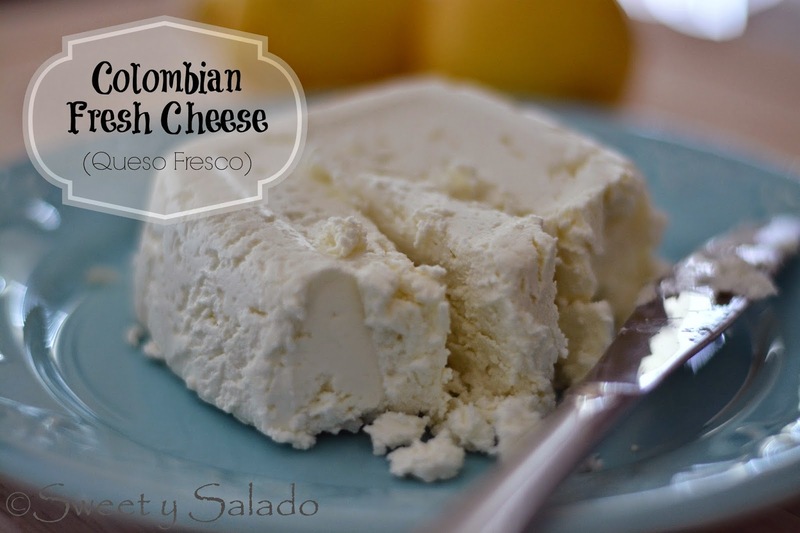 I use a combination of queso fresco, which is very similar to this cheese, for the texture, and feta cheese for the flavor. But many people who live in Spain have told me that they use ricotta cheese because it's very similar to queso costeño. Since I don't live in Spain, I can't confirm that information and the ricotta cheese I get here in the US is pretty creamy, so it won't work for me. They've told me, however, that the ricotta cheese you get in Spain is drier and works perfectly.